No. 34: War! What is it good for? 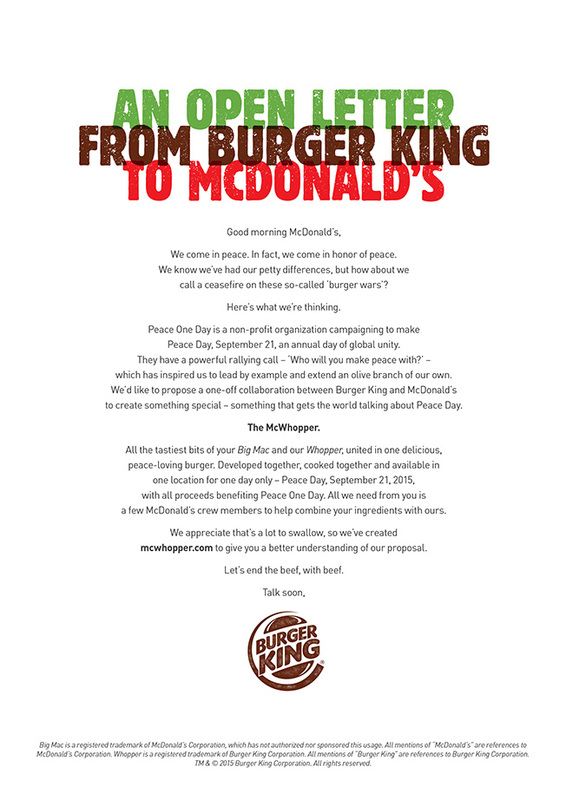 ★ Ostensibly to promote world peace day (yes, you read that correctly), Burger King launched what, on the surface, seems like a clever, effective idea—call a truce to the “Burger Wars” by collaborating with (ahem) arch rival McDonald’s to offer the “McWhopper”. It looks as though the McWhopper will never be—but what kind of a burger blog would this be if I didn’t create (and taste) one for you? Following Burger King’s proposed recipe, I dutifully recreated the Shelleyian monstrosity. As you can see from the 726 calorie behemoth above, it is a mouthful. That, unfortunately, is about as much as I can say for it. We’ve previously established that the Big Mac is a saucy mess; adding Burger King’s flame-broiled patty and a couple of sliced tomatoes below it did little to improve the taste. One bite was all I could manage. I’m giving the burger one star because it makes the blog look better, but in actuality it rates a zero. I found it to be tasteless and self-absorbed—much like the campaign itself, which is why I will review it instead. The stunt is, of course, completely disingenuous—the latest salvo in a decades long ‘war’ that no one really follows and fewer care about. The proposal was announced via social media, full page ads in The New York Times and Chicago Tribune, and a Burger King-created parallax Tumblr site. On the morning of the campaign’s launch, the hosts of NBC’s Today Show were fully prepared to recite lines from the press release, and had a sample of the hypothetical hybrid on hand. Here’s the basic idea: Burger King and McDonald’s call a one-day truce to their ‘war’ by coming together to create a half-Big-Mac-half-Whopper sandwich. The mashup would be offered at a purpose-built pop-up shop in Atlanta (half way between their respective headquarters), which would be staffed with employees from both companies. Burger King designed the shop, named the burger, created the web site and packaging—even designed the uniforms. All McDonald’s would have to do is say yes. Proceeds would benefit Peace One Day. The ad—which takes the form of an ‘open letter’ to make it seem less like an ad—as well as the site and the ensuing media coverage—are littered with words like truce, olive branch, ceasefire, treaty, and peace. After years of coopting the language of war to describe their business competition, it seems Burger King is now ready to usurp the language of peace for its own ends as well. That claim is endorsed by the appearance of Peace One Day’s actor-founder, Jeremy Giley, in one of Burger King’s promotional videos in which he implores McDonald’s to “get on board” because, as he puts it, “corporate activation creates awareness, awareness creates action, and action saves lives.” That’s a pretty short trip between buying a burger and saving the world. Besides Burger King’s callous hyperbole and the intellectual leniency of Giley’s equation of awareness and action, there is the issue of intent. If we are to accept Burger King’s framing of its commercial rivalry with the Golden Arches as an analog to actual armed conflict (which I do not), then it’s fair to view its ‘peace negotiation’ tactics through that same frame. Though the campaign is labeled a “sincere proposal” and letter calls for “collaboration” the fast food chain’s motives are neither sincere nor collaborative. Rather, they are entirely unilateral; Burger King has defined every aspect of the supposedly altruistic promotion and asked its rival to simply get on board. Yes, it says that everything is up for discussion (“the only thing we can’t change is the date”) but with three weeks and three days between its announcement and date in question, how realistic is that offer? Why not have that discussion with McDonald’s in advance? Why not collaborate privately and go public together? Surely it would still bring as much attention to the ‘cause’ so what would be the loss to Burger King? The answer, of course, betrays Burger King’s true intentions. But no one is asking the question. Anyone who stops to think about the mechanics of this stunt will realize immediately how shallow and mean-spirited it really is. Burger King, its ad agency, creative team(s), lawyers, and executives must have been preparing this for months. The concept, the promotional partnership with Giley’s organization, the copywriting, filming, video production, web and social media design, illustration, reviews, sign-offs, PR coordination, etc., etc. certainly didn’t resolve themselves in three weeks and three days. Anyone who stops to think about how the promotion was launched will also realize that it is not an offer of peace at all, but a carefully orchestrated sneak attack against the reigning superpower. The goal isn’t peaceful coexistence, it’s fast food supremacy. This was not designed to bring McDonald’s to the table, it was designed to embarrass them—to make Burger King look like the inventive, nimble, out-of-the-box-thinking, socially-engaged brand and McDonald’s look like the stodgy, uncreative, business-as-usual, wet blanket. Astonishingly, people don’t seem to be stopping to think at all—least of all the media. Just as they have in recent real wars, the media is eating up a pre-pakaged narrative. The day after Burger King ran its full-page ad in the The New York Times, that paper published an article regurgitating much of it and adding quotes from the Burger King-produced promotional video to which the original ad directed its readers. News headlines relating to Burger King’s promotional launch were universally positive, featuring phrases like “Burger King Invites McDonald’s...” “Burger King Wants McDonald’s Help...” “Burger King Boldly Proposes End to Burger Wars...” and “Burger King Wants Peace...”. A day later, when McDonald’s rebuffed the corporate stunt with a brief note on Facebook (adding, sensibly, “P.S. A simple phone call will do next time.”) they took a beating in the press: “McDonald’s shoots down Burger King’s Pitch For A Collaborative Burger to Promote World Peace” “McDonald’s rejects Burger King’s McWhopper Bid For Peace” and “McDonald’s Immediately Shoots Down Burger King Collab Idea in Least Fun Way Possible.”. 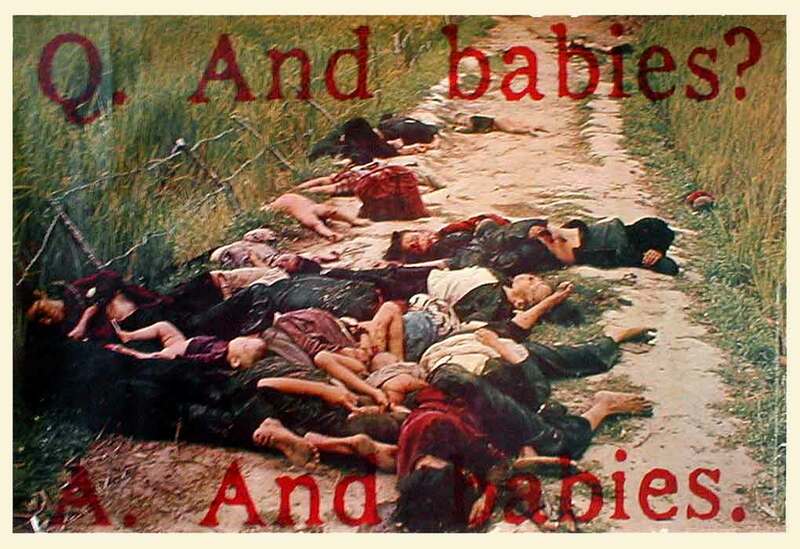 Meanwhile the one thing no one is talking about is world peace. Don’t Bite. People, it seems, will eat anything if it looks good—nevermind if it is nutritious or not, and Burger King’s promotional campaign has everyone—including the media—eating out of its hand. Burger King is described in positive, creative, even humanitarian terms while its rival is being saddled with starkly opposite descriptors. But just because you’re served something, doesn’t mean you have to eat it. Yes, by all metrics this seems like a highly successful promotional stunt. Burger King is getting great press without actually doing anything, and receiving virtually no critical inquiry into their tactics or motives. If they’re lucky, they won’t even have to raise a dime for world peace either (but will still be thought of as the company that wanted to). To anyone creative, I beg you: don’t be seduced by the tempting cleverness of shallow, snarky, antics like this one. Dig deeper. Bite off more. Actually do something. Truly collaborate. Be substantive. If you really want to bring about world peace, be peaceful. Be respectful. Be honest. Be real.